The RML Chevrolet Lacettis ruled the streets with an unprecedented 1-2-3 finish in Portugal for Round 11 of the 2007 World Touring Car Championship. 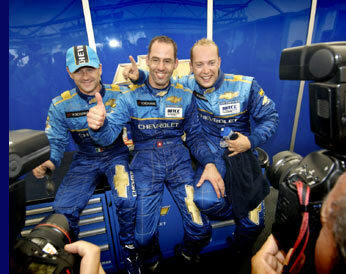 It was a third win this season for Alain Menu, with Rob Huff second and Nicola Larini third. Chevrolet continued its dominance in the streets of Porto by scoring a historic triple podium in the first of Sunday’s two races. Alain Menu, Rob Huff and Nicola Larini finished the incident-packed race in the order they had started in, letting none of their competitors even have a look at the podium. It was the first time since the beginning of Chevrolet WTCC programme in 2005 that three Lacetti’s locked out the podium. For Alain Menu, it was his third 2007 win, and makes him the first driver to achieve this level of success this season. Rob Huff scored his first podium finish of the year and set fastest lap in Race 1, but a misjudgment and dirty tyres from driving off line left him without points in Race 2. Menu again finished on the podium in the second race, after Larini crashed under braking while in third place. Menu now ties with Larini for fifth in the championship, but takes the position courtesy of his three victories. "Today has been a great day for Chevrolet and the RML team and I'm very happy for them. If you look back at where we were when we started in 2005, and here we are now, in first, second and third... In the second race the track was very dirty. I tucked in behind Nic at the start and stayed with him as we moved up the order. was a good day on a street track that typically suited the Chevrolet Lacetti." "As I said yesterday, we baked the cake in qualifying and put the icing and even some cherries’ on top today. It was a very good day, especially for the boys who have worked so hard. Alain and I pushed hard at the start, but between the three of us we knew that none of us was going to do anything silly. I had two of the world’s best drivers in front of me and right behind, so I knew I could just concentrate on keeping my second place. In the second race I misjudged passing Yvan (Muller) going into Turn 2, and then the wheels locked, so I ended up in the wall. I’m really sorry for the team." had a good run at Coronel and passed him for third. Then, defending my position on the straight I must have picked up some dirt going off-line and lost all grip when I braked, ending up in the wall. I’m really disappointed." "An awesome result for the team! Today has been another important milestone for us, whereby the professionalism of the team and the way we go about achieving the best for the whole team in every area clearly showed. To have Alain finish on the podium twice is the best proof of that." "What a valuable day! It was good to see that many expressive faces in this friendly country where Chevrolet and RML demonstrated the reliability of the Lacetti in its natural environment." Throughout the 2007 WTCC season, Chevrolet Insight will give you a behind-the-scenes look at the Chevrolet WTCC racing team. On Saturday and Sunday, media and fans alike will get the latest information and can ask their questions via the web in Chevrolet's own web cast. Visit www.chevrolet-insight.com. There are regular airings during the race weekend, and then a full 15-minute review programme can be viewed at any time after the event. 1. BMW, 167pts; 2. SEAT, 124; 3. Chevrolet, 111; 4. Alfa Romeo, 57. The next race of the 2007 World Touring Car Championship takes place in Anderstorp, Sweden, on 29th July. More information on RML is available at www.rmlmallock.co.uk.